The Manor’s Shari Mezza, assistant activities director, was presented with LeadingAge NY’s Employee of Distinction Award at a reception on Aug. 16th. 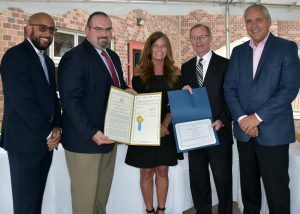 From left are Jason Santiago, Oswego Health VP and the Manor’s COO; Terry Wilbur, representing State Assemblyman Will Barclay, who co-sponsored a NYS Legislative resolution; Shari Mezza, Jim Clyne Jr., president and CEO of Leading Age, who presented the distinction award; and Michael Harlovic, Oswego Health president and CEO. 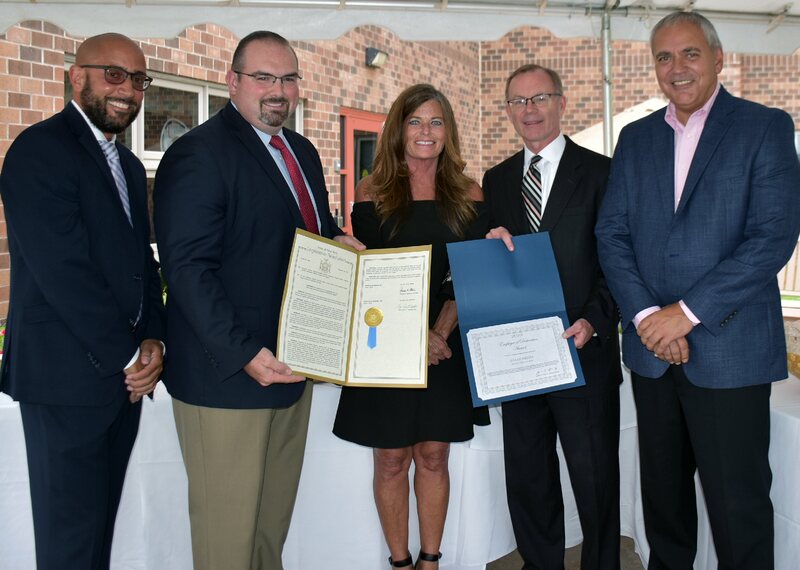 OSWEGO – The Manor’s Assistant Activities Director Shari Mezza was recently honored as an employee of distinction by LeadingAge NY at a special reception. Making the presentation was Jim Clyne Jr., president and CEO of LeadingAge NY. The organization is The Manor’s statewide not-for-profit long-term care association. This prestigious award is given to individuals who exemplify compassion, commitment to their organization, and go above and beyond in customer service to the residents in skilled nursing facilities. Clyne explained that only 16 such awards are presented each year, two in each region, by the association, which represents thousands of employees who work at skilled nursing facilities. Mezza was also presented a NYS Legislative Resolution that recognized her excellence in healthcare. The bill, co-sponsored by State Assemblyman Will Barclay, recently passed both the Assembly and State Senate. She was initially nominated by co-worker Helen Hoefer, with follow up letters of support sent by residents, their family members and staff members. Oswego Health Vice President and Chief Operating Officer of The Manor Jason Santiago told those at the reception that The Manor is known for providing excellent resident care. The facility ranked four out of five stars for its quality of care by the Centers of Medicare and Medicaid Services. Mezza has worked at The Manor for 13 years and says she goes home each night feeling very gratified.